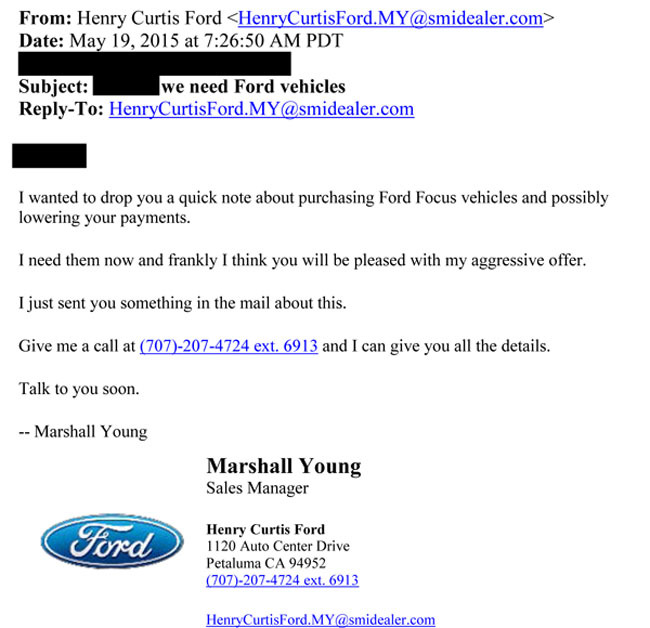 Has your Ford dealer contacted you about a special offer to “buy back” your Ford Focus or Fiesta because they need it? Most likely they’re not making this offer because they desperately need your Focus or Fiesta for their used car inventory. Chances are, Ford Motor Company has advised their Ford dealerships to “buy back” these cars in order keep them from becoming Lemon Law cases where Ford may have to really buy them back. When the manufacturer buys back a vehicle because of a warranty defect, the buy back consists of the following: a refund to the consumer of their down payment, all of their monthly payments, the current registration fee, any out of pocket expenses related to the defect (such as towing fees or rental car fees), and the entire loan balance is paid off in full by the manufacturer. The only deduction from the refund is for the mileage offset which is set at the mileage of the very first repair. If any aftermarket items were purchased, the manufacturers vary on what they will reimburse for. Gap Insurance, Service Contracts, alarm systems, and surface protection plans are not typically reimbursed to the consumer. In a true lemon law buyback, the lemon vehicle’s title is “branded” so that all future purchasers know that the vehicle has had serious problems. In addition, a decal is attached to the vehicle that reads “Lemon Law Buyback.” If a dealership then sells the vehicle, the dealership is required by law to notify the buyer in writing that the vehicle is a Lemon Law Buyback with potentially serious unresolved issues. The law mandates this in order to get the defective vehicle out of the stream of commerce. In the Ford Dealership “buy back” program, the dealership is going to turn around and sell the defective vehicle to another unfortunate consumer. 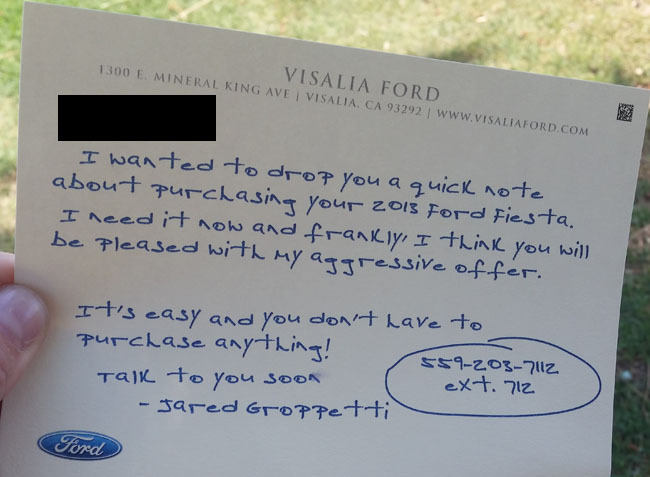 Ford Motor Company’s dealerships are not actually buying back the Ford Focus and Fiesta, they are taking them as trade-ins and putting consumers into newer Ford vehicles with little or no money down. There is no actual refund to the consumer and the 2015 Ford Focus and the 2015 Ford Fiesta still use the same defective DPS6 Dual Clutch “Automatic” transmission system that is used in the 2011-2014 Ford Fiesta and the 2012-2014 Ford Focus. In some cases, consumers are going from one problem vehicle to another. Ford Motor Company continues to face increasing numbers of Lemon Law cases over the same transmission problems with the Ford Fiesta and Ford Focus that they’ve known about for the last five years. If you have taken your 2011 to 2015 Ford Fiesta or your 2012 to 2015 Ford Focus into a Ford authorized repair facility at least four times for the same transmission system problems, we may be able to get Ford to buy yours back. 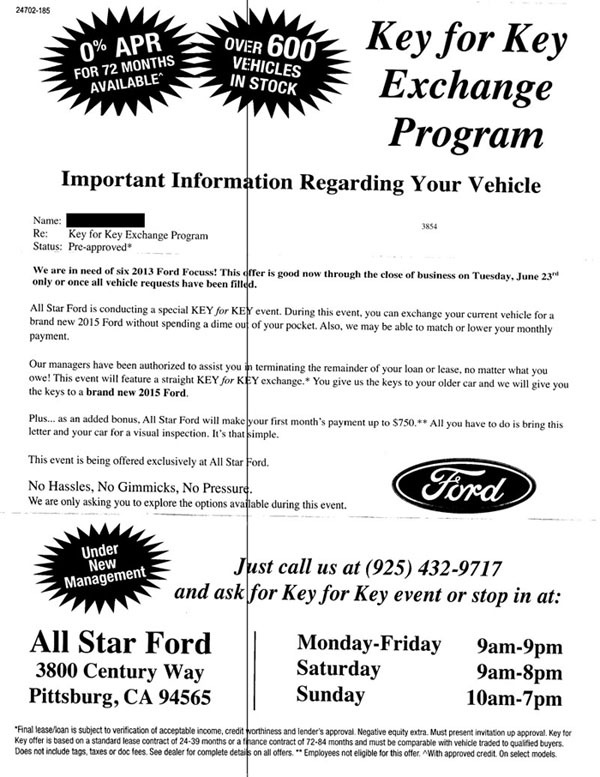 We have been getting Ford to buy these vehicles back based on both California Lemon Law claims and California Auto Fraud Claims for selling our clients vehicles with “automatic” transmission systems when in reality, the transmission system is a manual transmission system. Considering all of the above, do you really think your Ford dealer NEEDS your Focus or Fiesta as badly as their letters claim? This letter starts out with an attempt to make you feel as if you’ve been personally selected by telling you that you’re “pre-approved” for their special event. It then goes on to tell you how they’re in need of six 2013 Ford Focus vehicles. 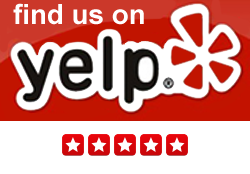 They also offer to make your first month’s payment, under certain conditions. 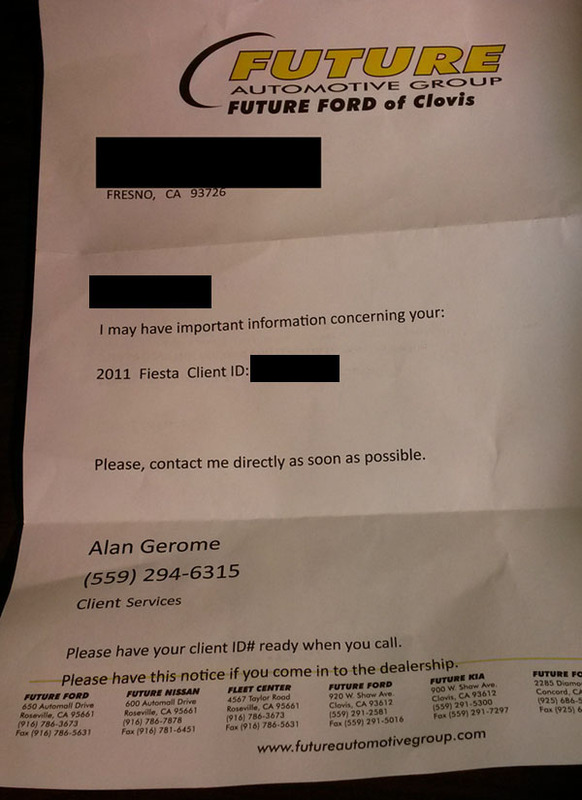 This Ford dealer sent out a more cryptic letter saying only that they “may have important information” about your 2011 Fiesta. Who would ignore such a letter? Ford is banking on the fact that the average consumer doesn’t know the difference between having the dealer put them into a new car through one of their special “buy back” offers and a lemon law repurchase. The only entity that can truly buy your car back from you under the California Lemon Law is the automobile manufacturer. A dealership may offer a “buy back” and they may even tell you that they are “buying your car back” under the lemon law, but the dealership does not have that ability. What the dealership is really doing is a dealer assisted trade-in. 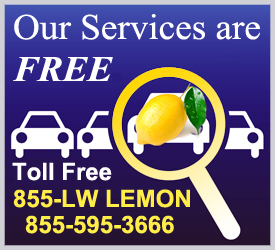 This solution does not give you all of the benefits of a lemon law repurchase. 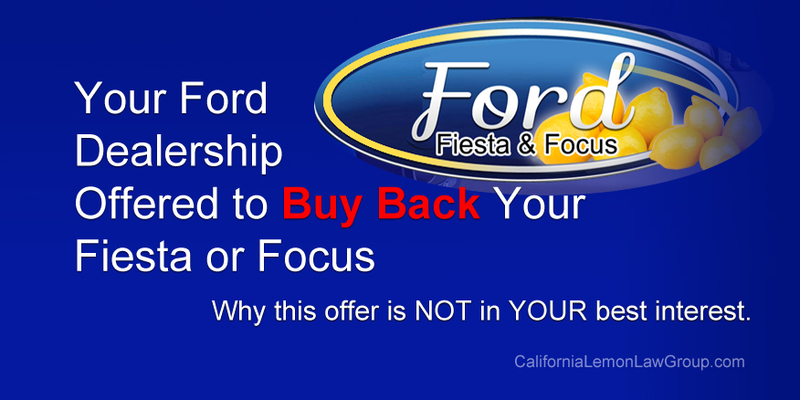 Please contact us BEFORE you decide to take your Ford dealer up on their offer to buy back your Fiesta or Focus.